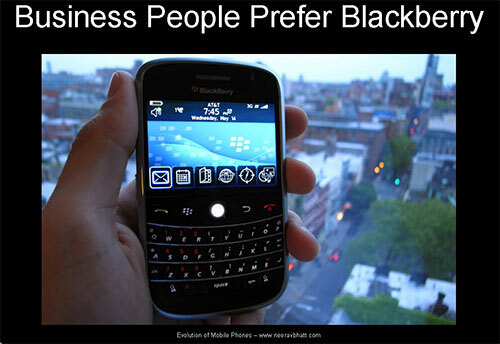 Business people who send and receive lots of emails prefer Research in Motion (RIM) Blackberry phones. I stated this in my Ignite Sydney 2 talk about the Evolution of Mobile Phones in early 2009 and most people would agree with my statement – but will it be the case in the future? Blackberry’s benefits are mostly beneath the surface of the actual hardware device and these benefits are “needs” like efficiency, security, reliability and speed rather than “wants” such as a great looking design, large touch screen and the coolest new features and services regardless of whether they’re 100% polished. Blackberry phones like the Bold 9700 lack the Glamour of iPhone and geek appeal of Android but prove a worthy contender as an efficient, multi-tasking communications workhorse which keeps powering on long after iPhone & Android batteries go flat. Blackberry’s strength is its operating system and services but it needs to better explain it’s hero features and inject some spirit and attractiveness into its handsets (from which makes around 4/5ths of its revenue) to stop people defecting to other smartphone platforms. That said, some people who switch to another smartphone like the iPhone may well return to Blackberry eg: Why I prefer Blackberry over iPhone for business when they find out how many features they took for granted are Blackberry specific. Personally as a smartphone reviewer who has tested many handsets including Google Android, Apple iPhone, RIM Blackberry and Nokia Symbian I think RIM’s Blackberry phones could hold their market share if they can provide a broader range of devices which include their trademark usefullness “needs” as well as “wants” like the iPhone’s great looking design and large screens as used in Android phones like the Google Nexus One. Neerav, good article and as a confirmed blackberry user, glad that you picked up on the security and compression elements of the handset. There are a couple of other features worthy of mentioning…the keypad allows much faster typing and the Blackberry Internet (BIS) page allows you to manage your emails far more effectively. lastly, I personally think that Blackberry will continue to grow into the consumer market with the release of the new edge and Storm 2. I have used Blackberry for many years and decided to give iPhone ago, a week ago! There is a completely different user experience between the two and I haven’t made my mind up which is best. The apps appear to work far better on iPhone, especially social media apps, music and so on. However I remain to be convinced! I will be interested in seeing how Storm 2 works out. Will be back to you with results of my iPhone v Blackberry user experience! Just a side note ….. for business people who use the MS Office products, I have found the Windows Mobile based smartphones to be much more user friendly than the Blackberry products. I use a Blackberry and I am extremely happy with its performance…I have no intention to go in for a iphone. I agree on the Email security functions and long battery usage time for the BlackBerry. I think it is the best in the market now and it is very suitable for business use. Its QWERTY keyboard is so good to use too. Generally, it is a awesome phone. Very nice post! The information which is provided is very detailed and crisp. I have been using BB since quite a long time now and am pretty happy with its performance. Thanks for this excellent post.